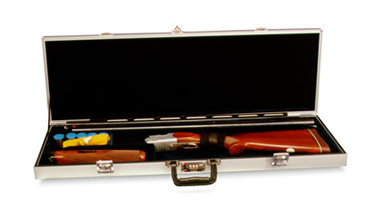 Americase 3017 Premium Custom Compact O/U Case, Fore-Arm Off, 34-1/2" x 9" x 3-1/2"
Custom manufactured case. Case will be produced when ordered, please allow three weeks for delivery. No returns accepted. Ext Dimension: 34 1/2" x 9" x 3 1/2"
BBL Slot: 32 1/2" x 2 5/8"
LH Storage: 7 1/8" x 2 3/4" x 2"
Fore End: 12" x 2 1/2" x 2"
Stock Size: 25 1/2" x 6 1/4" x 2"